Premium isolated. To your good health. - Bob Moore. Gluten free. 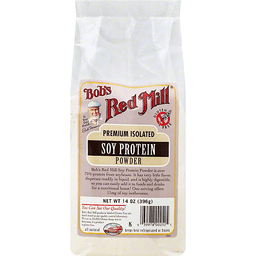 Bob's Red Mill Soy Protein Powder is over 75% protein from soybeans. It has very little flavor, disperses readily in liquid, and is highly digestible, so you can easily add it to foods and drinks for a nutritional boost! One serving offers 11 mg of soy isoflavones. You can see our quality! Bob's Red Mill products labeled gluten free are batch tested in our quality control laboratory. We use an Elisa gluten assay test to determine if a product is gluten free. All natural. Visit us at www.bobsredmill.com. For information and recipes, visit our website at bobsredmill.com.